Mark Messier left the New York Rangers to sign a free agent contract with the Vancouver Canucks for the 1997-98 season. Three years without qualifying for the playoffs and injury troubles made for a less than satisfying stay in Vancouver and Messier returned to the Rangers in time for the 2000-01 season. Putting the injury bug behind him, Messier played in all 82 games for the Rangers at age 40 and scored 24 goals and 67 points, his highest totals since 1996-97, his final year in New York before leaving for the Canucks. The Rangers however, would also fail to qualify for the playoffs, finishing 10th in the Eastern Conference. The 2001-02 season would see the injury bug return, with an arm injury limiting Messier to 41 games and 23 points and the Rangers once again outside the playoffs looking in. Back to full health in time for the 2002-03 season, Messier played in 78 games for New York, scoring 18 goals and 22 assists for 40 points. Messier began his final NHL season with 1844 career points, six back of Gordie Howe and his career total of 1850 points, good for second place on the all-time scoring list. He opened the season with an assist in Minnesota and then added his first goal of the season three games later to give the Rangers a tie against the Carolina Hurricanes. An empty net goal would follow two games later icing a 3-1 win versus Detroit followed by his third goal of the season two more games later, again versus Carolina to give the Rangers their final goal in a 4-1 victory. His trend of scoring in every other game continued, this time to give the Rangers a two goal lead against the Colorado Avalanche, only to see the Avalanche come back and win 3-2 in overtime. Messier now stood at 1849 points - one behind Howe. The next Rangers game was a home game versus the Dallas Stars on this date in 2004. The first period passed scoreless, but at 1:37 of the second period, Messier scored on Dallas netminder Marty Turco as he deflected hard drive by Alexi Kovalev to pull into a tie with Howe and give the Rangers a 1-0 lead. Matthew Barnaby would add a second Ranger goal at 15:01 of the second. The third period passed scoreless despite the Stars out-shooting the Rangers 17-3 and the Stars Turco was pulled for an extra attacker with 1:11 to play. As he skated down the right side, Kovalev fed Messier who put the puck in the back of the vacated net from the other side of the red line and threw his hands up into the air as the Rangers bench emptied to celebrate with their captain as his family hugged each other in the stands as Messier moved into sole possession of second place in the all-time NHL scoring list. "I have a tremendous amount of respect for Gordie," Messier said. "My dad was affiliated with the Detroit Red Wings back in the 1950's and early 1960's. He attended some training camps, he played with Gordie in some exhibition games. So he had a first-hand account of Gordie as a hockey player as well as a person. Growing up with that and then passing him at that moment, there is a little trepidation because it seems like Wayne (Gretzky) and Gordie are synonymous with each other." 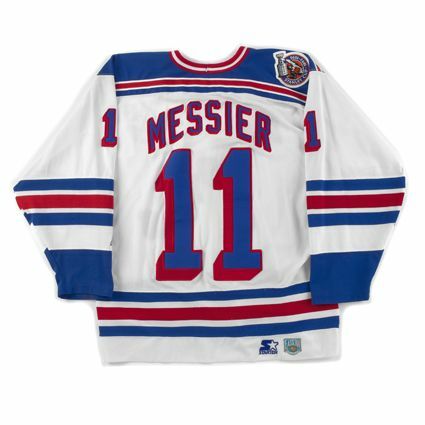 Today's featured jersey is a 1992-93 New York Rangers Mark Messier jersey. 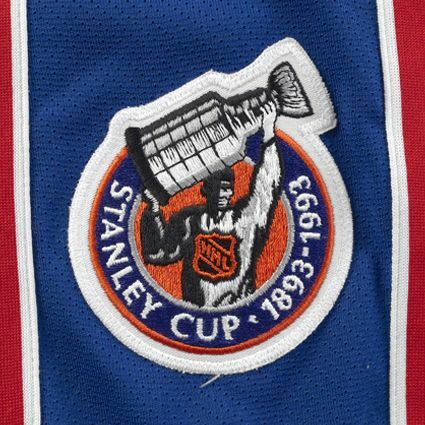 This jersey features the Stanley Cup Centennial patch worn on all players jerseys during that season, but only the Rangers wore the patch on their right shoulders due to the diagonal RANGERS cresting on the front of the jersey interfering with the standard location on the right chest. This career retrospective video on Messier includes a clip of him scoring his empty net goal to pass Gordie Howe for second place on the all-time scoring list. 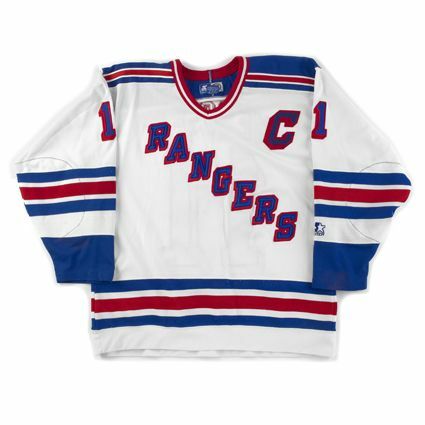 Also take note of the throwback jersey he dons while being introduced as a New York Ranger for the first time. This video countdown ranks his goal to pass Gordie Howe as #2 on the list of Messier's Top 10 Career Moments.